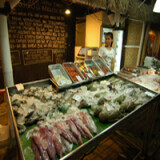 Indonesia is famous with its natural wealth. 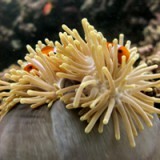 This country has many species of flora and fauna that cannot be found in other country. Its tropical climate is the beautiful heritage for Indonesian people and also other people all the world. Therefore, many places are being international tourism object and being favorite destination by the tourist, local and international. 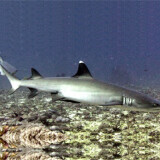 One of the most popular tourism objects is Gili Air. 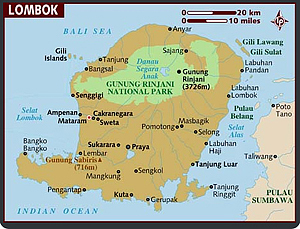 It is located 50 km to the east Bali. Beside Gili Air, there are two small island, Gili Trawangan and Gili Meno. It is easy to travel to Gili Air. You can choose between using plane or speed boat. Starting flight to Lombok in International Airport, Praya, then you need to take a taxi and ask the driver to drive to Bangsal Port. Then continue your trip by using boat to Gili Air. You can find flight schedule daily from Singapore, Malaysia, Jakarta and Bali. If you want to get a cheap cost to Gili, fast boat is your best choice. But you need to take it in Bali. There are so many boats from Benoa, Serangan and Padang Bai. The boat is operated daily, so you can go there whenever you want. It can bring you to Gili Trawangan, Gili Air and Lombok directly. Gili Air offers beautiful scenery as a Paradise Island. 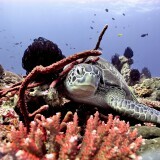 Crystal blue water, coral, manta, white shark and turtles will accompany your activities there. You also can enjoy the sunset with drink a glass of lemon juice or hot tea. Its white sand will wonder you. 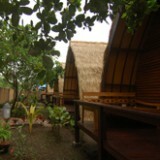 You do not have to worry about the lodging facilities in Gili Air. 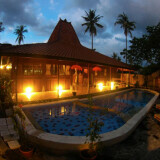 There is the best hotel, Omah Gili. 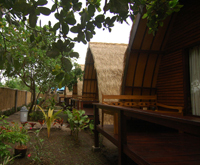 It offers different lodging atmosphere. The design of the building is so natural. Immediately enjoy your tourist activities in Gili Air. Although it is the best hotel for you, it has special price for the traveler.